Right now, I’m wearing an old pair of jeans with a few small holes and a Chicago Cubs t-shirt that dates from 2002 or 2003 (the shirt references Kenny Lofton, who played with the team in that time frame). These are old, worn out, yet still very comfortable clothes and they’re perfect for wearing around the house. I will wear these clothes around the house until they’re truly ready for the rag bag, at which point they’ll be used for rags (an old t-shirt makes a great rag for many household tasks). I’m getting a ton of value from these articles of clothing, and all it takes is a little bit of organization. For the most part, I keep my clothes separated into three separate groups: “dress” clothes (ones I feel comfortable wearing at nice situations), “good” clothes (ordinary clothes that are newer and have experienced relatively little wear), and “house” clothes (the ones like I’m wearing today, which are well worn but still functional). Clothes move between the groupings over time, particularly when “good” clothes get downgraded to “house” clothes (occasionally, “dress” clothes will move down as well). In general, I don’t get rid of clothes until they’re actually falling apart and unacceptable for “house” clothes. If they reach that point, they usually become rags and are used that way for many years. I usually start my day by choosing clothes based entirely on what my plans for the day are. If I’m going to be at home all day, I’ll choose “house” clothes. If I’m going to be running a lot of normal errands, I’ll choose “good” clothes. If I’m going to be doing something special, I might choose “dress” clothes. If circumstances change during the day, I just change clothes. For the most part, I don’t donate clothes. The biggest opportunity I can see for selling or donating clothes is when a person’s sizes change, and my clothes sizes haven’t changed dramatically in either direction in a long while. It’s a simple system, probably not too terribly different than what you do. However, there’s savings inherent all throughout the system. For starters, you’re getting every drop of value out of every item that you add to the system. If you wear an item of clothing until it’s truly ready for the rag bag, then you’ve extracted pretty much all the value you can from that item. Your cost per use of that item is likely going to be really, really low, and that means with each use of that item, you saved some money. Another element is that you’re strongly rewarded for buying durable clothing, as discussed previously. If you buy an item of very durable clothing, insert it into your “good” or “dress” clothing rotation, and use it until it’s actually ready for the rag bag, you are going to get a lot of uses out of that item of clothing. Your cost per use is going to be miniscule. For example, this t-shirt I’m wearing was very well made and I’ve found myself wearing it monthy over the past ten years. If you assume I paid, say, $30 for it, it’s now down to a cost of $0.25 per use. The combination of a well-made clothing item with a system where I wear the item extensively results in an incredibly low cost to clothe myself. Not only that, this system provides a steady supply of oil rags, window cleaners, grease applicators, and other useful household tools. The “rag bag,” consisting of very old clothing, is a perfect place to look if you’re about to paint or do something else really messy. In a pinch, I’ll even toss on an old piece of clothing from that rag bag to keep myself from getting too messy. 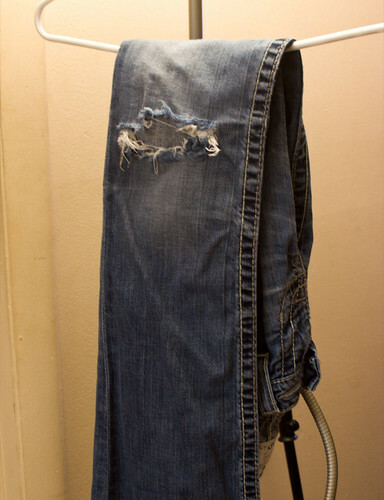 The key is extracting as much value from your clothes as you can. It’s your money invested in the clothing, after all. Why not get every cent you can out of it?